High seismicity around the island was recorded on 17 and 24-26 July. The largest earthquakes (M 4.0) were detected at 1250 and 1321 on 17 July. The Global Volcanism Program has no Weekly Reports available for Niijima. Local seismicity increased in the sea NW of Nii-jima on 21-22 September. Residents measured no significant changes in temperatures of the island's hot springs during this period. Because epicenters were close to the island, more than 20 events were felt, the largest of magnitude [3.5 (JMA)]. Earthquake swarms are common around Nii-jima; the most recent was in August-September 1983 [when the largest event was M 4.2]. An earthquake swarm was recorded on 3-4 January, centered 10 km SW of Nii-jima near Shikine-jima, a dome of the Nii-jima complex (figure 1). The largest shock, M 3.1, occurred at 0657 on 3 January. No surface anomalies were observed at the volcano or on the surrounding sea. Three weeks later, a swarm was recorded near Kozu-shima, 20 km SSW (figure 2). Figure 1. Epicenter map of earthquakes near Nii-jima and Kozu-shima, January 1992. Courtesy of JMA. Figure 2. Epicenter map (top) and space/time diagram (bottom) showing seismicity around Kozu-shima and Nii-jima volcanoes, January 1991-June 1992. Courtesy of JMA. A seismic swarm recorded between 0200 and 0400 on 19 March consisted of 10 earthquakes beneath and around the island (figure 3). Several of the events were felt by island residents, the largest, M 2.5, at 0349. No surface anomalies were observed. Figure 3. Epicenter map of earthquakes near Nii-jima, 19 March 1992. Courtesy of JMA. A weak earthquake swarm was detected in the sea a few kilometers E and W of the island on 28-29 August. The strongest event was M 2.3. Two weak earthquake swarms occurred 5 km WSW and NW of the island on 16 and 22 September. Maximum magnitudes were 3.5 and 3.1, respectively. No ocean-surface anomalies were observed. A swarm of earthquakes occurred midway between [Nii-jima and Kozu-shima] islands 17-20 October. The largest earthquake was M 5.1, at 2237 on 17 October. No ocean-surface anomalies were observed. A weak earthquake swarm occurred 23 March in the N part of Nii-jima island. The earthquakes, M 1.9 maximum, were located both onshore and offshore. . . . No surface anomalies, onshore or offshore, were observed . . . .
. . . An earthquake swarm on 9 September near Nii-jima island . . . included a M 3.7 event. On 4 December, many earthquakes occurred in and around the island, some of which were felt. The largest one was M 4.3. 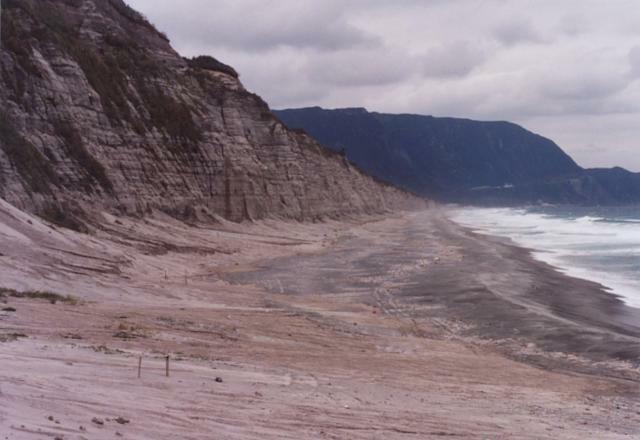 The elongated island of Niijima, SSW of Oshima, is 11 km long and only 2.5 km wide. It is comprised of eight low rhyolitic lava domes that are clustered in two groups at the northern and southern ends of the island, separated by a low, flat isthmus. The flat-topped domes give the island the appearance of two large plateaus bounded by steep cliffs. The Mukaiyama complex at the southern end of the island and Achiyama lava dome at the northern end were formed during Niijima's only historical eruptions in the 9th century CE. Shikineyama and Zinaito domes form small islands immediately to the SW and west, respectively, during earlier stages of volcanism. Earthquake swarms occurred during the 20th century. Koyaguchi T, 1986. Evidence for two-stage mixing in magmatic inclusions and rhyolitic lava domes on Niijima Island, Japan. J. Volcanol. Geotherm. Res., 29: 71-98. There is no Deformation History data available for Niijima. 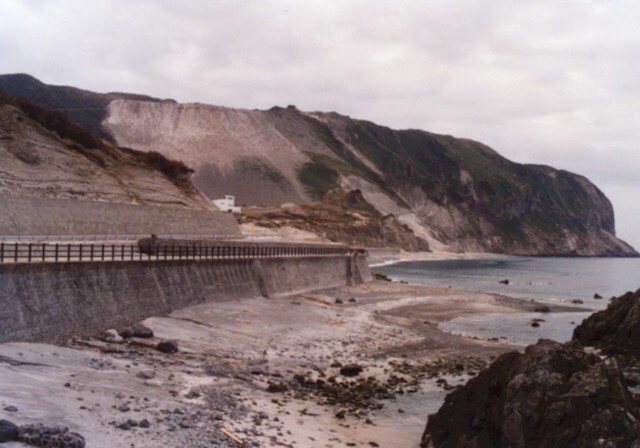 There is no Emissions History data available for Niijima. Stratified phreatomagmatic deposits are exposed along a cliff on the eastern coast of Nii-jima, with flat-topped Miyazuka-yama lava dome in the background. The 11-km-long, elongated island is comprised of eight low rhyolitic lava domes that are clustered in two groups at the northern and southern ends of the island, separated by a low, flat isthmus. The Mukai-yama complex at the southern end of the island and Achi-yama lava dome at the northern end were formed during Nii-jima's only historical eruptions in the 9th century CE. The rhyolitic Mukai-yama lava dome lies at the southern end of the island of Nii-jima. It was formed during a single continuous eruption in July 886 CE beginning in shallow water with the formation of a tuff ring by repeated base surges, followed by a subaerial pyroclastic cone and lava domes. The flat-topped Mukai-yama lava dome (also known as Muko-yama) marks the most recent eruptive activity on Nii-jima. A spectacular sequence of pyroclastic-surge deposits are exposed in a sea cliff on Nii-jima, in the northern part of the Izu Islands of Japan. 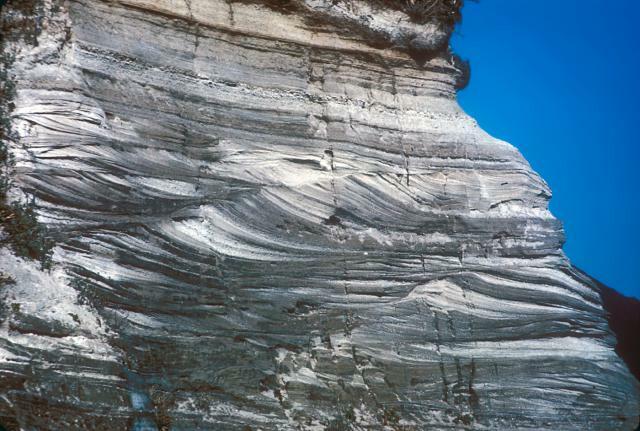 The dramatic cross-bedded layers were produced during episodic erosion and deposition by laterally moving ash clouds. The eruptions accompanied formation of a lava dome at Mukai-jima on the southern part of the island. Flat-bedded airfall deposits cap the exposure. Photo by R.V. Fisher, 1979 (University of California Santa Barbara). Large Eruptions of Niijima Information about large Quaternary eruptions (VEI >= 4) is cataloged in the Large Magnitude Explosive Volcanic Eruptions (LaMEVE) database of the Volcano Global Risk Identification and Analysis Project (VOGRIPA).